Unless you have a naked cat or a hypoallergenic, non-shedding dog, your furry friend is affecting your household air quality. While our four-legged are certainly worth it, they can make proper HVAC service and air quality a bit more high-maintenance. At Air Temperature Control, Inc., we believe that every home can improve its air quality by following a few simple HVAC service rules. For homes with pets, these guidelines are even more important. 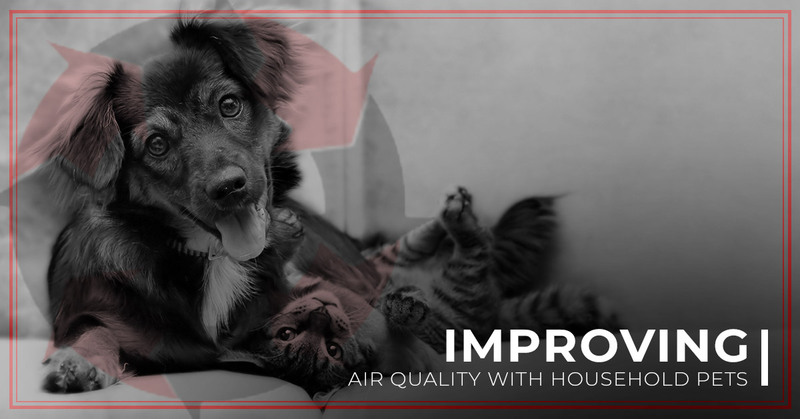 Consider the following information about the connection between pets and household air quality, and contact us today in Belleville for HVAC service! Dog hair on the couch isn’t just unsightly — it’s also a leading cause of poor household air quality. You can mitigate some of these effects by sweeping and vacuuming routinely, but even that doesn’t fully take care of the problem. That’s because dog hair has the capacity to weave itself into the fibers of our couches, carpets, and upholstery. Try as you might, and dog hair will still be present in your home. When dog hair gets stuck in our home, it clogs up air conditioning filters, vents, and systems. Even if you aren’t allergic to dogs, you should be concerned about the presence of dog hair. When dog hair gets stuck in filters, it spreads harmful toxins and allergens throughout the environment. It also has the capacity to damage your air conditioning unit and furnace. Your filters usually trap dog hair before it gets into the machinery of your HVAC systems, but this is still something to take care of. When your filters become too clogged with dog hair, it becomes much harder for your A/C unit or furnace to perform its job. As a result, your utility bills go up, your air conditioning fan might need repair, and you’ll need to spend money on HVAC service. To mitigate the negative effects of dog hair, pet dandruff, and other animal-related allergens, home air quality solutions can be implemented. Germicidal UV Lights: these HVAC systems reduce airborne allergens and bacteria by up to 97 percent; they also kill mold and generally create cleaner air. Whole-Home Humidifiers: correct home moisture levels can make a home much more comfortable. Whole-House Air Cleaners: these work in conjunction with your A/C and furnace to reduce air pollutants like pet hair. If you are curious about any of these air quality solutions, contact Air Temperature Control, Inc. in Belleville to learn more! In general, households with pets should clean their air filters twice as much as residences without pets. If you have a dog or cat, you should be changing your HVAC filters at least every three months. A local HVAC repair company can help to keep your filters maintained and keep your household on a healthy schedule. For HVAC service or air quality tests in Belleville, contact Air Temperature Control, Inc. today!